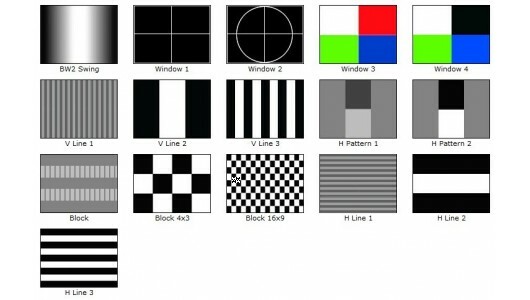 Generates video patterns for testing HDMI or DVI displays. Supports audio test signals. The HDMI DVI Video Pattern Generator is a battery powered, portable, compact unit that generates video test patterns for evaluating HDMI or DVI displays. Featuring 34 static and dynamic video test patterns and 48 timings up to HDTV's 1080p, the unit will quickly determine color performance, linearity, and HDCP. 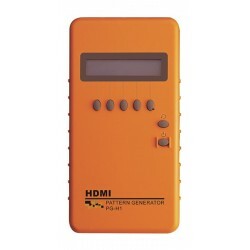 Easy to use five button control of on-screen menu thru 16x2 LCD screen. Includes a built-in rechargeable battery, power adapter, and one HDMI 1.2m cable. Front panel control buttons through 16x2 LCD. Auto power-off on battery mode. 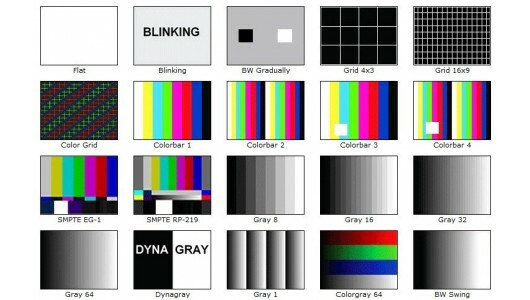 Provide total 34 video test patterns and 48 timings, which include color bar, gray, grid, block. Supports audio testing -- 48KHz sample rate, 1KHz tone. Compatible with any HDMI or DVI interface. One HDMI Type A connector for output. WxDxH (in): 3.77x7.1x1.33 (96x180x34 mm). Convert an HDMI male port to DVI male (or DVI female to HDMI female). Convert an HDMI female port to DVI female (or DVI male to HDMI male).